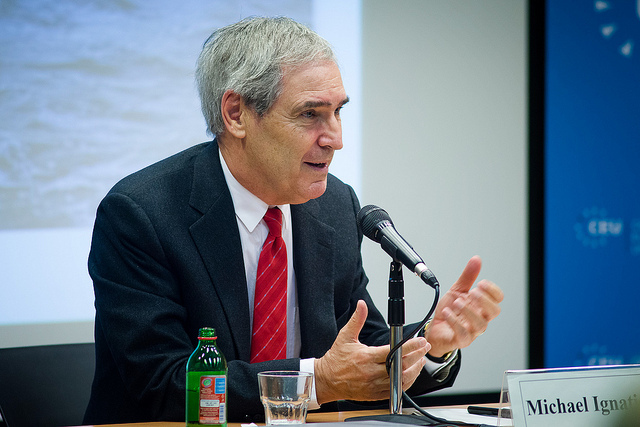 The refugee crisis was amplified by a failure of western intervention policies, the loss of control of European borders, and insufficient support for refugee camps, according to Professor Michael Ignatieff of Harvard’s Kennedy School of Government, who spoke Jan. 12 and 14 at CEU. Looking at the reasons of the current exodus, Ignatieff pointed to Western states’ failure to support the World Food Programme and the frontline states, Turkey, Lebanon, Jordan and others, that receive the brunt of the mass migration of refugees. He also pointed out that the countries where refugees come from have one thing in common: they all experienced NATO interventions. Syria is the only exception where the failure to intervene contributed to the situation. Although the current refugee crisis is referred to as “unprecedented,” the 20th century was the century of forced migration in Europe, Ignatieff said. Refugee policy is always forged in crisis. International refugee protection initiatives, such as the Nansen passport, which allowed refugees to travel across the continent without shame, were prompted by states’ sense of being overwhelmed and overburdened, a constant feature of 20th-century European migrations. The Universal Declaration of Human Rights and the Refugee Convention of 1951 were responses to the unprecedented population movements of stateless and desperate people across Europe after WWII. Policymakers were forced to come up with new international legal instruments, such as the principles of universal human rights and universal obligations to refugees. Today, we’re living through a crisis of universalism, when the universally binding nature of human rights and states’ obligations to strangers is challenged and the achievements of 1948 and 1951 are under attack, Ignatieff said. The legal definition of refugees and migrants, granted by the 1951 Convention, doesn’t address problems we face today, such as state collapse or state violence, Ignatieff noted. The universal regime of human rights and refugee rights only triggers upon securing entry to a state. By keeping refugees out, states are not bound by these universal obligations. The “return of the sovereign” today challenges universal rights, Ignatieff warned. The images of policemen struggling with keeping order at the borders, and states’ failure at controlling immigration put the question of sovereignty and the power of states in an international cooperation such as the EU back into the limelight, he said. How to be a responsible leader of a sovereign state and respect universal human rights and refugee rights is a dilemma Angela Merkel, the chancellor of Germany, is facing now. Ignatieff is now concerned as to whether states will continue to be bound by the universal regime of the right to have rights and provide asylum to those fleeing persecutions, civil war and state collapse, or whether we all end up losing our universal rights. One of the outcomes of the different ways European states coped with the crisis was the “shattering of European solidarity.” The Schengen Agreement, the treaty abolishing internal border controls and establishing a common visa policy in member states, is in serious danger, and the European-American cooperation is also showing signs of weakening, with the US “acting as a bystander” and offering only financial assistance, Ignatieff said. “The moral scandal of the situation is that while we are sitting here talking, refugees come all the way on foot, drowning in the water, dying from exhaustion. And this is because we handed border control over to smugglers and crooks,” said Ignatieff. Therefore, first and foremost Europe should regain control of its borders, even with the possible deployment of naval forces, he said. Examining the question of democratic consent is also vital, he said. “We have to face the fears of citizens, recast the integration bargain and regain consent for refugee protection. The key is of course integration,” Ignatieff said. In the conflict between sovereignty and universal human rights a balance has to be found, and according to Ignatieff quota limits on refugee admissions seem to be the only solution in this case. Direct repatriation, which would mean the processing of asylum applications at the refugee camps would also eliminate the need for the perilous exodus experienced now. The most important task is to stop the war in Syria, though. The first step could be a UN-supervised ceasefire in the country. “It will not be easy, and an excruciating moral trade-off will be required for peace. But we have to stop the war,” he said. “If we say yes to the refugees, and they say yes to our values, we will grow together. Nations that shut their door will stagnate culturally and economically,” Ignatieff said in conclusion. 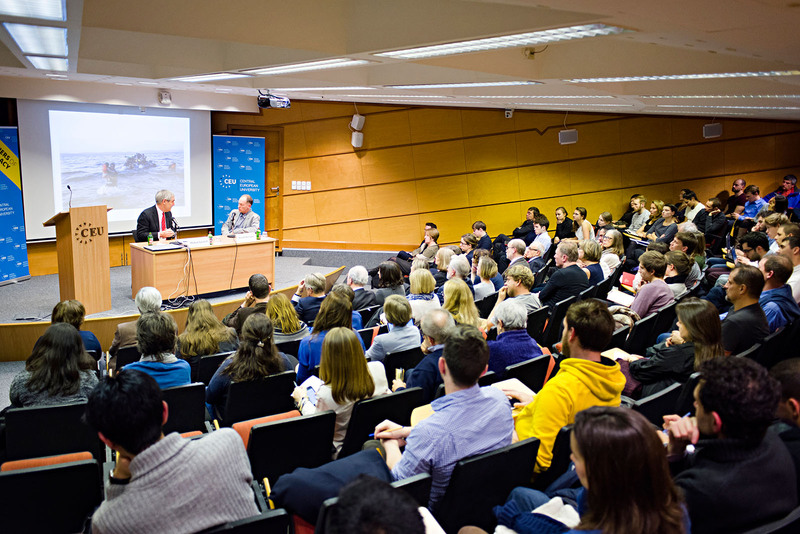 Professor Ignatieff's talks were part of CEU's Frontiers of Democracy Initiative.